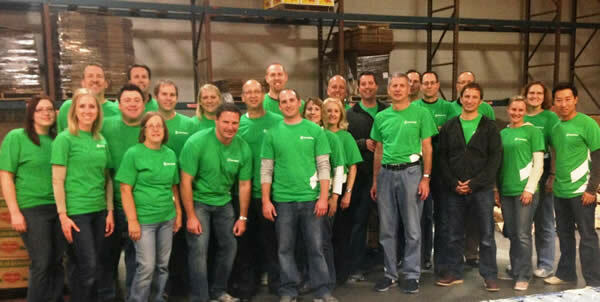 Recently, two Associated Bank departments organized their teams to volunteer at Feeding America. The Milwaukee Marketing team spent a day processing food for the organization and knocked out 10 pallets worth. Feeding America was surprised by how much the team was able to accomplish. Corporate and Commercial Banking colleagues soon followed with one of the largest groups ever volunteering at Feeding America with a total of 24 colleagues. “This group of colleagues is very caring, and as soon as we sent out the invitation, they were quick to say yes,” said Jane Nehls, senior sales and support specialist, Associated Bank. She and Tom Peterson, commercial banking business segment leader, Associated Bank, helped organize the team building experience. The team helped organize food, clothes, candy and household items donated by Walgreens into separate categories.